A hallmark of research is that it is neutral and thus open to unanticipated results and findings. 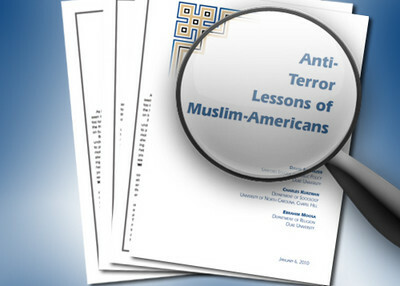 Reading "Anti-Terror Lessons of Muslim-Americans," a new report by researchers at Duke and the University of North Carolina, it seems like these two NCAA rivals came together to violate this cardinal principle of scholarly research. The report's headline is that the threat of homegrown extremism is exaggerated. That's an odd conclusion just a week into 2010. While the authors acknowledge 2009 was an unusually active year for homegrown terror plots, the litany of cases is insufficient to alter, or even place an asterisk by their conclusion. This seems to rebut an argument no one has made while miscasting the very nature of terrorism. Terrorism does not require large numbers of people to achieve its purpose, which is the creation of fear through calculated and often symbolic acts of violence or the threat of such acts. Terrorist groups have lasted decades and wreaked havoc without having more than a couple dozen members. Further, it doesn't take an army of thousands to generate death and devastation. Ten Lashkar-e-Taiba terrorists were able to kill more than 180 people and hold Mumbai – a city of more than 14 million people - hostage over three days. Pointing out that relatively few people become terrorists is irrelevant. Nidal Malik Hasan killed 13 soldiers and wounded 30 more at Fort Hood on his own. The Duke/North Carolina study, funded by the Justice Department's National Institute of Justice, identifies 139 people linked to terrorist violence since 2001, an average of 17 people per year. But in the past 14 months, 20 young Somalis disappeared from the Minneapolis area and are thought to have gone to East Africa to join the jihad there. Five D.C. area college students were arrested in Pakistan last month as they tried to join the jihad against American troops in Afghanistan. Like the Zamzam group, most of the cases included in the study involve terrorist plots outside the United States. For example, David Headley is charged with plotting to attack the Danish newspaper Jyllands-Posten and with helping the Mumbai plotters by scouting possible targets. The report devotes a page to the North Carolina jihad plot, emphasizing the group's desire to wage jihad abroad. But it fails to mention that Daniel Patrick Boyd is accused of scouting the Marine base at Quantico for a possible attack and that he and defendant Hysen Sherifi were charged in September with plotting to kill American soldiers. And the data doesn't count cases involving terrorist financing, listing them as "exclusively non-violent activities … because, in our view, individuals have not fully radicalized unless they are willing and have taken steps toward violent action to further their radical views." It is simply bad social science to view the phenomenon of terrorism as isolated from all other factors and activities besides violent acts. Terrorist acts are at the tail-end of a process of radicalization through which an individual comes to believe in the necessity of radical action through interactive social processes often fostered and guided by Islamist movements. Violent Islamist movements do not just blow things up. They produce propaganda, raise funds, engage in dawah and educational efforts, and often provide services to their constituency. All of these efforts are an interrelated part of a whole and cannot be separated – not even by two universities with first-rate basketball teams. We should expect better from a research team that prominently features a sociologist. The emphasis on the number of people prosecuted diminishes significance of the threat of terrorism because plots were interdicted before they had a chance to succeed. If even a fraction of them were successfully executed, the death toll could reach into the thousands. It's a fundamental weakness of the argument to argue this threat is exaggerated. Their definition ignores the radical dogma that goes along with "non violent activities" and the often-used Koranic solicitation that those who finance jihadists are blessed the same as if they participated. After the Fort Hood massacre, journalist Asra Nomani described Nidal Malik Hasan's slaughter as "a cautionary tale to all Muslim communities about the consequences when we fail to win the war of ideas in the Muslim world with moderate interpretation of Islam over rigid, literal interpretations." She interviewed a man who attended the same Maryland mosque as Hasan and debated theology with him. Hasan espoused clearly radical views and a literal interpretation of the Quran. "No one in the mosque responded with concerns about Hasan's extremist views," Nomani wrote. But they did object when his interlocutor handed out a newspaper article about an Afgan suicide bomber who accidentally killed his mother and other family members. An angry mosque member accused him of creating a "fitna," or division, in the community. The report credits the Islamic Society of North American (ISNA), Islamic Circle of North America (ICNA) and the Council on American-Islamic Relations (CAIR) and the Muslim American Society (MAS), but makes no mention of their well-documented radical ties and the counter-productive ideologies they espouse. ISNA was created by Muslim Brotherhood activists in the United States, some of whom remain active. While it engages in numerous interfaith outreach programs, it has a history of tolerating radical statements in its conferences and by some of its own activists. "Indeed Allah purchased from the believers, their lives and their property, in return for Paradise. They fight in the Way of Allah, they slay and they get slain themselves… And then it [the Qu'ran] says, "Who is more faithful to his covenant or promise, than Allah (swt), then rejoice with this bargain." You see, it's a bargain. Allah bought it [life], but he gives something in return." As we've reported, ICNA is related to the Jamaat-i-Islami, which advocates for revolution to create an Islamist state in Pakistan. While officials expressed shock that American college students were arrested in Pakistan as they tried to join a jihad against American troops in Afghanistan, the group canonized an American who died waging jihad in Kashmir 12 years earlier. Then there's CAIR. The FBI cut off contact with the group, despite its political profile, because it has not determined "whether there continues to be a connection between CAIR or its executives and HAMAS." That connection was demonstrated in documents admitted into evidence at the Hamas-support trial of the Holy Land Foundation, which ended with sweeping convictions in November 2008. CAIR, along with MAS, often perpetuate the notion that American anti-terror efforts amount to a war on Islam, a message considered pivotal in radicalization. Even if their intentions are good, their efforts are likely to fall short based upon the organization's inherent beliefs, wrote M. Zuhdi Jasser, founder and executive director of the American-Islamic Forum for Democracy. "CAIR and [the Muslim Public Affairs Council] have typically renounced the use of terror and violence, but they have never taken a position against the ideology of political Islam," Jasser wrote. "They have also been constant antagonists to efforts by law enforcement to understand and mitigate the real stages of radicalization of Muslims in America. Just recently these groups called for government to naively "decouple religion from terror." "Muslim-American organizations and the vast majority of individuals that we interviewed firmly reject the radical extremist ideology that justifies the use of violence to achieve political ends," David Schanzer, the co-author of the study, said in a statement. When one reads such a statement about groups that have recommended one of Osama bin Laden's favorite books – Sayyid Qutb's Milestones – it is hard not to laugh. If he modified this statement to explain they only rejected the use of violence to achieve political ends here, but not elsewhere, Dr. Schanzer would have been closer to the truth. America Needs to WAKE UP!!!! When will Americans get it through their heads that while there is still a war to be fought in the Middle East, it is right in front of our eyes here on our home soil. The recruiting tools these terrorists use to recruit young impressionable men and women, are working! Those who are held locked up in prison are radicalized, much w/o issue, because they have nothing else to look forward to when they get out of prison, is working!. Being in the US Armed Forces, it makes me sick to know we have terrorists among our ranks!! This should be the biggest wake up call!...I could spend all day spitting out cases organizations who are linked to terrorism, but the bottom line is, that all Americans have an obligation to their country, their families, and themselves, to stay situationally aware of what's going on in their communities. The very fact that you have to READ and try to understand these contorted lies and twisted language, where Truth is called a lie, that islam is peaceful, that we don't understand it and need to be EXPLAINED: this is part and parcel of the horror. We are being forced to enter their nightmare world simply by having to read about it, in order to fight it! When I was a kid, I remember hearing, "all arabs are liars" as a standard refrain. To even bother to discuss:"...the relationship between the two variables..." means you are already trapped in their deadly web. The TRUTH is plain to see and needs no islamic interpretation. What is the true intent behind each of these opinions? Both the Duke/UNC and your hypothesis have validity, but what is the true intent behind each of these opinions? The relationship between the two variables is simple ways for each of your organizations to drive their agendas forward. Neither is truthfully accurate and many key facts are left out. The majority of the questions posed or address will not pass a statistical significance or measures of association test. These are the kinds of assessments that guide us into wars and are mostly written by individuals and organizations that have never even been in the field or met the people or groups they are describing. on target. Why can the USA not see. The problem today is Islam, the religion itself as taught and passed along.